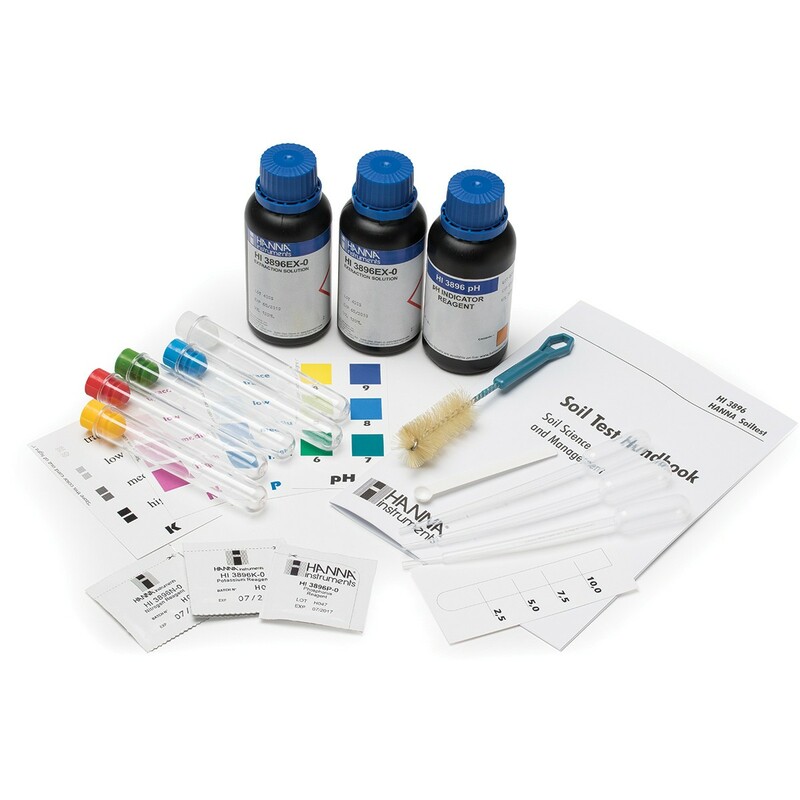 Hanna HI3896 NPK Soil Chemical Test Kit 25 tests each . The HI3896 is a chemical test kit that uses colorimetry and turbidimetry to measure four parameters common in soil testing: nitrogen, phosphorus, potassium, and pH. The HI3896 is supplied with all of the necessary reagents and equipment to perform each analysis, and all reagents are individually available as they run out. Hanna’s Soil Test Kit provides users with a fundamental tool to assess important characteristics related to soil quality. The soil pH range from pH 5.5 to 7.5 is inclusive of most plants; however, some species prefer a more acidic or alkaline environment. Nevertheless, every plant thrives within a particular pH range. pH strongly influences the availability of nutrients and the presence of microorganisms and plants in the soil. The three macronutrients that are most needed by plants are nitrogen (N), phosphorus (P), and potassium (K). Other elements, the so-called microelements, are generally present in sufficient quantities in the soil as plants need them only in smaller doses. HI3896 test kit includes 120 mL extraction solution (2), 70 mL pH indicator, 75 powder packets (25 each for N, P, K), 1 mL pipettes (3) test tubes (5), test tube stand, spoon, brush, color cards (4), graduated card, and handbook.